+ Are you searching and have found the fullness of Truth in the teachings of the Church? + Are you Catholic and never completed your initiation Sacraments? + Are you curious and just want to learn more? Catholicism is a way of life and becoming Catholic is a journey in faith. The Rite of Christian Initiation of Adults (R.C.I.A.) is a process, rooted in history, which seeks to do more than simply give interested persons information. Becoming Catholic involves entering into relationship with a community of God’s people. Our hope is that you will enjoy a deeper relationship with God as you also become acquainted with members of St. Jerome Catholic Church and the Catholic Church throughout the world. This is a unique time for you. You will no doubt notice how your own life experiences and beliefs have brought you to this point as you listen to God’s invitation. At the same time, members of the parish are praying for you, attending classes with you, and sharing their own life stories as Catholics. Adults baptized in another Christian church who might desire to become a Catholic. Adults baptized Catholic who have not received full reception into the church through the Sacraments of Eucharist or Confirmation. Adult Catholics who would like to update or deepen the knowledge of their faith. How long does it take? The Rite of Christian Initiation is not a program of exact timing. It is the gradual process of a spiritual journey which may take a short period of time or a number of years. 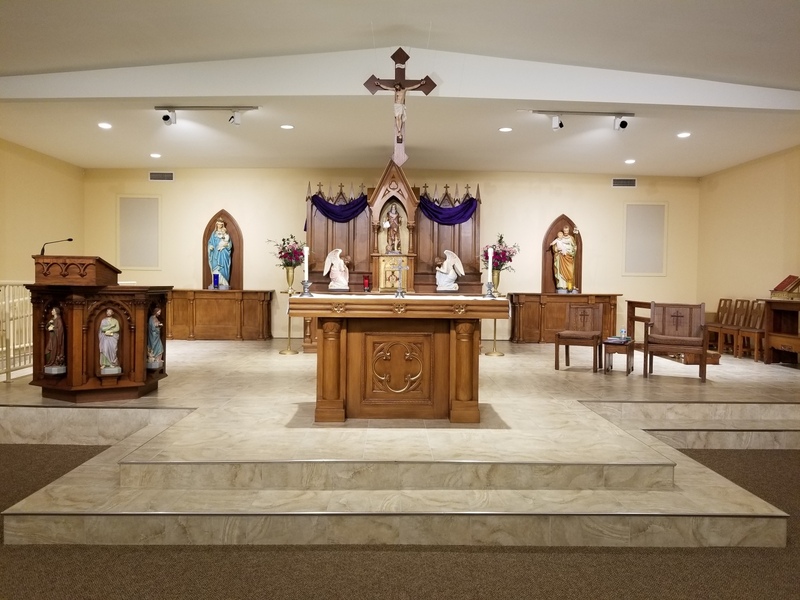 At St. Jerome we normally offer the RCIA program from the early fall through the winter with the Sacraments of Initiation being received at Easter. What if I was baptized in another church? Once your baptism is verified, you will not be baptized again. In the Rite of Initiation, those who have received baptism will make a profession of faith in the name of the Father, Son and Holy Spirit and will receive the sacraments of First Eucharist and Confirmation. What is the first step? If you are seriously considering becoming a Catholic, or would simply like more information about the Catholic Faith, please contact Deacon Paul Nungester at 419-666-2857 ext. 106 or deaconpaul@stjeromewalbridge.org. What is the process? The Rite of Christian Initiation (RCIA) is the process by which an interested person becomes a member of the Catholic Church. This is a gradual process within the community of the faithful. It is a spiritual journey. The RCIA, as a rite, marks the various steps on the way to full commitment within the Catholic Church. It includes five specific periods.